Al Bridge was equally at home playing the boss heavy (dress heavy) or a grizzled henchman. 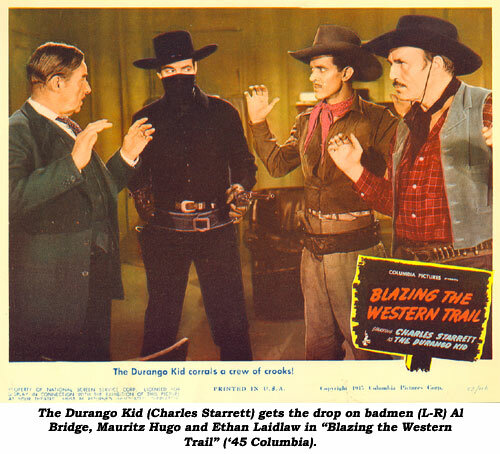 He gave the impression in dozens of B-westerns the only fun he got out of life was obtained by cheating, lying, rustling and killing. He seemed to always have a cigarette in his hand. His voice sounded like a person who had been a heavy smoker. 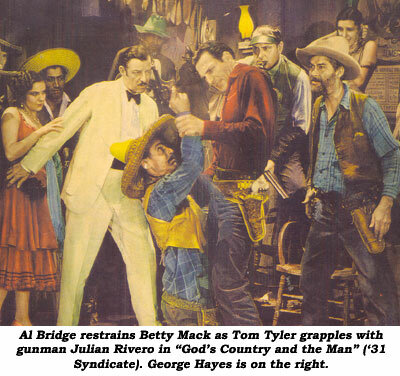 Bridge spent 24 years in front of a camera, from ‘31-‘54, menacing Tom Tyler, Bob Steele, Rex Bell, Hoot Gibson, Ken Maynard, Tom Keene, Buck Jones, Charles Starrett, 3 Mesquiteers, Gene Autry, Bill Elliott, Johnny Mack Brown and others before finally seeing the light towards the end of the trail and playing the Sheriff role in several Roy Rogers and Rex Allen films and on TV with Gene Autry and a few others. Alan Marton Bridge was born in Pennsylvania on February 26, 1891. His parents, Charles Bridge and Louise Blackburn, were both Pennsylvania natives.After serving with the armed forces in WWI, Bridge was a reporter for the KANSAS CITY JOURNAL and attended Georgia Brown Dramatic School in Kansas City. Bridge then managed and starred in his own musical-comedy stock company which also included his sister, actress Loie Bridge (Barnett) (1889-1974). 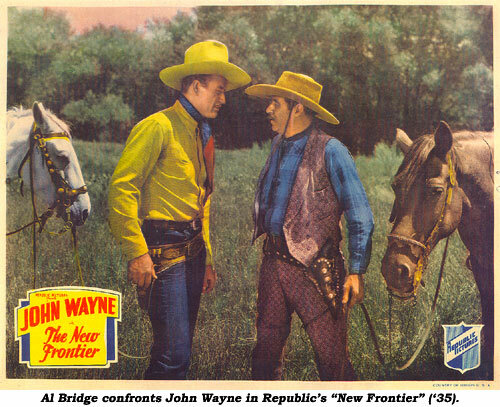 Arriving in Hollywood at the time of transition to sound, his first billed appearance was in Tom Tyler’s “God’s Country and the Man” in ‘31 for which he also was credited with additional dialogue. 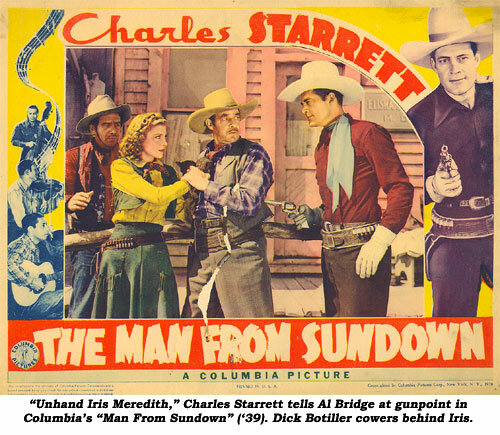 Besides westerns, Bridge worked in 16 serials, his best roles coming in “Devil Horse” (‘32 Mascot), “Fighting With Kit Carson” (‘33 Mascot), “Mystery Mountain” (‘34 Mascot), “Burn ‘Em Up Barnes” (‘34 Mascot), “Adventures of Rex and Rinty” (‘35 Mascot), “Adventures of Frank Merriwell” (‘36 Universal) and “Jungle Jim” (‘36 Universal). Bridge also appeared in many A-films and was a member of the famed Preston Sturges stock company of characters. Once married to Hazel Belford, Bridge was divorced at the time of his death at age 66 on December 27, 1957, at his home on South Gramercy Park in Los Angeles. Primary cause of death stated to be heart disease with emphysema as a contributing factor. Remember—on screen he usually held a cigarette. The veteran badman whom Rex Allen once said was “a better rider than many professionals” is buried at Valhalla Memorial Park in North Hollywood where you’ll note that his birth year is given at 1891 rather than 1890 (as reported on his death certificate) and his first name is spelled Alford (not Alan).